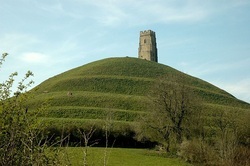 Glastonbury Tor - Did A Portal Open on 26/02/07? The Tor at Glastonbury is a natural 520’ conical hill set in the Somerset landscape, its legends and accolades are many ranging from a faerie hill, the Entrance to the Underworld of King Gwyn Ap Nudd, a global energy point where ley lines cross, and tales of people being suddenly levitating whilst up there, as sworn by a group of Buddhist monks in 1969. So many are these stories that it is really difficult to attempt writing anything refreshingly new. A book in 2005 by author Nicholas Mann who lives in the area, ‘The Secret Energies of Glastonbury Tor’ goes some way in trying to explain with a scientific approach electro-magnetic vortices at work. Can this hill justify the wondrous tales of coloured lights seen emanating from it, earth lights that can spiral, the least optical phenomenon associated with any self respecting fairy hill? I personally know of two friends, who individually, on separate occasions have experienced what they describe as a ‘beam’ come down from the sky and pass from their head right through their body. And so it goes on! If it is an energy point then one fact that people of Glastonbury can’t be denied is that every year the rock music festival that first started in 1970 now draws into the small town approximately 180,000 visitors camping out over its three days in June every year - that’s a lot of energy to soak up! Now, as much as I would like to dismiss all these tales as mere romance and declare the hill simply that - a hill and nothing more - I have to admit on a personal level that I can’t! Since 1984 I have had and have a strange relationship with this hill, like no other place I have visited, it is almost as if it draws me to it…And if that were true in any sense, for what purpose? I first went there at about 4pm on October 30th 1984, approaching the ascension from the far end of the Tor. As I began the steep climb, a small breezy wind came out of nowhere, growing stronger and stronger as I made my way up. By the time I had reached the top, it was blowing a private gale! ‘Some welcoming committee’, I thought to myself, as in those days I was well immersed in Theosophy and how geographical areas can have elemental guardians called Devas, or landscape angels. The Tor is associated with a wind that can whip up and can even blow people from its summit. Accepting this baptism, I returned again that night as had been my original intention, setting off up there at 11.30pm and intending to stay until the hours moved into 31st of All Hallows Eve where we are assured the veil between worlds thin, as far as our calendar is concerned. As an impressionable, young, scientifically minded and intrepid investigator, where better to be at a time where worlds may merge, than upon a faerie hill! With the absence of any wind, I was no sooner up there when a silent silver streak at a height of above four feet above my head flashed from left to right a short distance! Minutes later, along came more phenomena - a speedy bombardment on either side of the top of the slopes of what I must describe as grey ‘ping-pong’ balls, lasting only moments! I have since learned that other people have also used the same term ‘ping-pong balls’ to relate their own similar experiences! A silent silver flash and a bombardment of ping-pong balls, all within minutes of being up there...at the tender age of 28 I was fast beginning to learn that Glastonbury Tor IS more than just an average high mass of land! I stayed a further two hours that cold early morning with naught else to report despite my hopeful and sincere intonations directed at the Archangel Michael whose tower sits upon the very top, calling him by his magical names of Mikaal-Sabbathiel-Beshtar, (everything is worth a try for a more pyrotechnical response!) returning through the wispy streams of mist at 5am in the morning for one last effort. Since that first acquaintance with the Tor, I have visited many times in all seasons, with and without people, all times of the days and in all weathers whenever the opportunity has arisen, with nothing out of the ordinary to report. At the time I would seek so-called paranormal experiences as they seemed to excite me - stationed up hills that can potentially emit sudden strange lights is a lot better than your typical average evening television viewing! The more I read sensible investigations into ‘earth lights’ and the fine book of that title by Paul Devereux, the more I was beginning to accept this as the rationale behind most if not all of the stories associated with the Tor. Without evidence, you can only listen with wonder at anecdotal stories and should stick to your own direct empirical experiences, as others are perfectly entitled to with my own offerings. Having said that, one story did trouble my comfortably settling in theory. 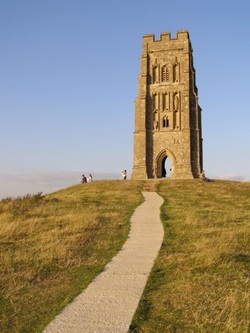 I received an email from a previous Mayor of Glastonbury who one night saw a reddish orange light appear ABOVE the Tor and sink into the summit, not come out of it! He was convinced it had been the usual understanding of a ‘spaceship/UFO’. Sinking INTO the Tor? Over the years since the sixties and to this current day, there have been a number of UFO sightings associated with above Glastonbury Tor, and amongst the many coloured light sightings this orangey-red does seems to be the most common. I wondered if this could have anything to do with the fact that high up on the Tower is a carving, I’m not sure why, of the Phoenix, or Fire Bird. Maybe the Collective Unconscious had been at work there influencing the mind of the carver. The Phoenix rises from the ashes, and so I smile at the synchronicity of knowing that at the foot of the tor since the seventies lives the Arthurian author Geoffrey Ashe. With all this in my mind, I wondered if it could be possible to dare attempt to pick up any aerial phenomenon on film?...and so, after last visiting the Tor in 1997, I returned in 2006; this time, and for the very first time in all my visits, armed with a camera (non digital as I learn this goes against critical analysis of phenomenon on photos). At this point, let me clarify the situation for you. Here I am on my own embarking up what has to be my favorite spot on earth, having been there numerous times, in all weathers, seasons, and times of the day - it simply doesn’t matter, as nothing can affect that strange awe and respect I have always held for this mound. The notion in my mind was to impress upon the Tor could I possibly ‘be allowed’ something to pick up on camera. This of course would imply that such a thing could happen. How? Well, for an answer to that one you will have to bear with my preferred belief that, in harmony with Gaia Hypothesis, the earth can be a living, thinking organism and biosphere; that Nature can hear and think, and may even respond to an earnest request. Some will find this ‘far out’ to which I respond, what gives people the authority to assume the world to be as they think it? Sometimes the ‘way out’ is the way in! Having made my thoughts known to anything that may exist to hear and respond to them, I was approximately two-thirds up the Tor when something strange happened. I was awash with a great irrational fear that was so strong my reaction was to want to turn back and rush off down the Tor! But what about my attempted photography that I had travelled 223 miles to Somerset to experiment? Who cares, I could only think of resorting to what us British refer to as ‘doing a runner’ – a swift retreat! Now, my ego must inform you, this is NOT my style – I run away from nothing, neither have I ever suffered what are called ‘panic attacks’, and yet this term certainly describes what had happened to me. However, I steadied myself and sat down a while, then eventually continued my way back up the remaining distance to the top, with tourists on either side unaware of how I was still filled with this awful trepidation. Once up there I took my pictures and was content to come away from Glastonbury Tor as swiftly as I could. All the while up there I remained filled with a fear that I have never experienced in my life or ever dreamt I could. What on earth had happened to me? Perhaps a part of the strange answer involves the series of dark aerial dots that were captured on film, moving themselves about. There was nothing in the sky to declare at the time the shutter snapped, no birds, planes, not a thing, but on sensitive film that can be known to capture images beyond the human eye were the dots. Better than that, to the right at the back of the Michael tower, a peculiar cross-shaped object had appeared! Critics who weren’t there will invariably cite a bird or a plane, some have even said an insect (! ), but I repeat there was nothing in the clear sky, and this essay is not for the critics, but for those who also suspect there may be more than meets the eye, literally, concerning this famous hill. In 2007, I returned again in June to the Tor hoping to repeat the experiment, actually having filed the fear-filled attack away as a puzzling ‘blip’ on the radar. It wasn’t even fresh in my fading memory when I began my familiar ascent from the Chalice Lane end - which some may find as hard to believe as the manifestations. Incredibly, and at the EXACT same place point up the winding path as before, it happened to me again, and just as frightening. I repeated my immediate thought of the earlier year, “I’m off!’ having to freeze to the spot in order not to do a runner! As before, I eventually managed some degree of composure to reach the tower and to take more photographs in the clear blue and uninterrupted sky with that horrendous fear of trepidation never leaving me for a moment. The best description I can offer is a feeling that I was just about to drift off weightlessly above! With the camera fulfilling its 27 exposure, I was more than pleased to legitimately retreat. There were more dots appearing on the pix again, but most amazingly, the cross-shaped ‘UFO’ object had re-appeared in EXACTLY the same position! In 2008 it was a sunny June again, and this time I was more than apprehensive about the twice inexplicable panic that had filled me at the same spot the two years running, and for good reason when in rushed the by now familiar alarm at the same point of ascension, only this time it was worse than the last two combined. I WAS going to run off this time for sure! In what was fast becoming a tradition I didn’t, and continued after a long period to the plateau to use the film up. Now, this time, when eventually up there, I felt rather calmer, quite bearable. Two friends accompanying me knew nothing of my earlier traumas or what I was experiencing now. The developed film heralded no phenomenon. Desperately trying to make sense of this trio of adventures I could only return to a dependency on the Gaia Theory – had my thoughts and intent been received and part of the ‘deal’ was that in order to be granted manifestations I would have to forfeit an ordeal? Or could it not have been avoided? How could I know? ...leaving me only to record the incidents and leave it at that. The last few yards of the walk up the Tor. 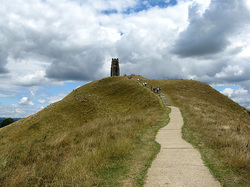 In August 2009 I ascended the Tor by my usual route, with two relatives who were aware of my previous troubles. In order to change the factors involved, I brought no camera and was seeking no photographs of any nature. Both my daughter and grandson were shocked when I informed them - at the same spot as the prior three years - that I could go no further! Leaving them to continue alone, I sat there looking at the tower in the distance and saying to myself, “I can never reach up there again!’ as that was how my feelings were translating. How could I accept never being able to visit my favourite ever spot, even though I now had to accept that this overpowering apprehension was now part of my equation? After the customary time lapse, angry with myself, I came up with the idea to climb down off the path to the left and along one of the embankments some way and then continue back up the steep side to the path again. I managed this and could continue the remainder of the walk where I again felt quite calm at the top of the Tor. My theory of being ‘granted’ photos for a ‘forfeit’ clearly didn’t fit. My daughter took a picture of the spot where for consecutive years approaching the Tor from Chalice Well I reached an area that against all probability and rationale forbade me to cross! It’s tempting to suggest this could be some sort of weird Tor energy ‘force field’ that I had now developed a sensitivity to? I have applied all logic to these adventures. Had I suddenly at my age developed acrophobia, a sort of fear of heights? No, my physiology did not meet the criteria anywhere near enough, and there were no physical symptoms at all such as dizziness, heart palpitation or lack of breath. Nothing but that irrational ‘panic attack’. A part of me found this most ironical, as during the 80’s in conjunction with my understanding of the Collective Unconscious I had conducted, with great success, psychological experiments with the archetype of the nature god Pan, whose presence instills instant panic! The rustic image of this half man-half goat Greek god was shamelessly stolen by the Christian Church and used to represent their Satan devil figure. Such echoes of dipping into, arguably, the realm of magick, were far from my mind, but was the archetypical energy of the god - in myth Overseer of the faery realm - awaiting me at the Tor? The following day, again changing the factors involved in the total equation, I ascended from the other available path at the far end of the Tor with my grandson and Glastonbury resident Mike Chenery. This way up is quicker, but much steeper. Apprehensively all the way, I made it up there without a fault! I had arranged to meet with Mike, for he too has an amazing story to tell, and again, I will tell it for those who can find it a possibility that the Tor is simply more than just a steep hill. However, it is a sad fact that in this world of computer wizardry there is very little that cannot be faked in the way of photographs, which makes it nigh on impossible for people like Mike and myself, with genuine unlikely pix, to be taken seriously. On February 26th 2007 at 4.33pm on a bright day Mike was walking up Well House Lane when his attention was drawn to the fact that all the singing birds had suddenly stopped their song. This stillness and suspension reminds me of what occurs at the time of a solar eclipse when birds become temporarily disorientated. He was now at a gate that provides a vantage point view of one of the un-arched sides of the tower. Casually looking up he saw a dazzling white ‘something’ that, in his words, ‘glided’ a short distance from within the tower. At first it showed itself as thin but then moved its perspective facing Mike’s direction and in doing so widened, rather like at first being as a door seen sideways on and then full frontal. As he always carries a camera during his numerous excursions, he only just found the time to take a picture and then the apparition that had only lasted seconds, simply ‘popped off’!! There had been nobody else up on the Tor at the time. The result on his digital camera confirmed what he had seen with his own eyes, a spectre of some definition, but what could it have been? For some clues to this mystery I have taken a closer look at the carvings that appear on the front of the Tower. My contention places firm belief that specific works of architecture are often brought about by the Collective Unconscious working through an unsuspecting human agency that if interpreted correctly can afford us clues to something of a hidden value. I find it intriguing that the highest carving on the tower is that of the Phoenix, a bird of Arabia so called owing to it possession of a scarlet colour - the colour that is most prominent in the weird earth light displays. The Phoenix also represents immortality, life after death and mystical rebirth. So why should this be above the Tor? We see St Michael and the devil, weighing souls. 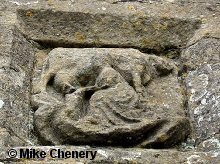 To their right is St Bridget milking a cow. Bridget was originally the Celtic, and possibly pre-Celtic, goddess Brighde. Her earliest representations associate her with fire. Why too should she be situated there, is it because both Bridget and Phoenix have this red, fire association? It is said that the Gateway to the Underworld opens only on the days of a fire festival, St Bridget having such a date on February 2nd. Employing the lost Mother Tongue language, a form of Esperanto that can link up languages and sciences into a cybernetic fashion and revealed to me by my autistic savant wife Avril, when we look at the name ‘Glastonbury’ we can see ‘Glass-stone-bury’ or ‘Glass stone ruby’. Is it that simple - a buried glass stone or buried glass ruby stone is somehow associated with the Tor? Ruby, is of course, a pure transparent (as would be a glass stone) red corundum. The key word here may be ‘transparent’ from Latin ‘parere’ meaning ‘to appear’. Back to Bridget-Brighde, and by consulting the phonetic, visual pun and anagrammatic language of the Mother Tongue, try pronouncing the name ‘Bridget’ without saying ‘Bridge shut’. Are we drawing attention to a shut bridge? Bridge comes from the old English ‘bryg’ and a ‘brig’ is a two masted, square rigged vessel from the word ‘brigantine’. Does this ship have a porthole? Or, does this ‘spaceship’ have a ‘portal’? Looking closer at the word ‘bridge’ we find that it is anything that connects across a gap or makes an electrical connexion between, and its synonyms include; arch, link, connexion, connect. Under enlargement, the dazzling white shape caught on camera shows an outline not unlike a tomb headstone and I wonder if we are seeing the actual archetype and origin for such a structure, something of an arch whereby the soul will pass through to liably voyage beyond. The dazzling bright white reminds me of the descriptions seen down a tunnel in near death experiences. Is this, indeed a time-space Portal, a normally ‘bridge shut’ and place of mystical rebirth of the Phoenix? Can such a Portal exist on Glastonbury Tor and is this what Mike Chenery has photographed physically opening for a few moments of our known time? Is the Michael tower with its two-sided arch you can walk through and out, a physical living unconscious memory of a replica, dimensional Portal? For some reliable confirmation and a startling conclusion, my interpretation returns to the stonework images on the tower that I believe to have been provided by that Collective Unconscious confirming the presence of a Portal. We see Michael and the Pan-like figure of the devil weighing souls on a weighing scale, the devil having a foot on his scale attempting to weigh it down. The key words here are ‘Scales’ and ‘Way’ (phonetic of ‘weigh’). ‘Way’ means ‘passage’, and ‘scales’ in musical composition is a progression of single notes upwards or downwards in steps. The imagery of the devil tipping down his scale is to draw reference to the infamous augmented 4th, or ‘Devil’s Chord’, prohibited by the church in the 12th century. My friend, the Scottish author Brian Allen, has evidenced in his own work ‘Rosslyn, Between Two Worlds’ a belief that there is a Portal contained within Rosslyn Chapel and that this devil’s chord is a key and sound frequency involved in opening the Portal. I smile when I recall how the devil was always represented holding a pitch-fork which I think we now can more correctly view as an acoustic resonating tuning fork which can be used to emit a pure musical tone. The pan pipes, or syrinx, of the god Pan also involve specific acoustic octave properties. As Allen suggests, does a specific frequency or harmonic note, along with this devil’s chord, provide the science that opens a Portal? It should therefore be no surprise that Glastonbury has this entwined musical connexion with its annual festival. 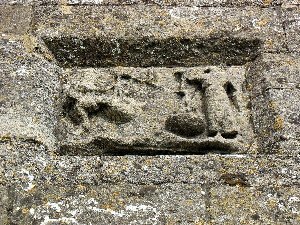 We return next to the carved image of St Bridget seen milking a cow into a pitcher, the musical term for pitch means to ‘set in a key.’ With Bridget we are inviting in a ‘bridge’, which in classical music is also known as a ‘transition’, the word meaning ‘a passage from one place’. Through the Portal... the mystical re-birth of the Phoenix allegory?